“We hope this year’s carnival is better serviced because of better supplies,” said Eugenio Blanch. August 18 (teleSUR) Concerts, dances, floats, music and an abundance of food and drinks will be the main ingredients of Cuba’s Havana Carnival. The festivities, which kicked off Friday, include an expanded program compared to the previous year. A total of 18 carnival krewes and 14 floats will deliver extravaganza and celebrations to Havana’s Carnival. The main events will take place along the famous Malecon where stands have been installed and numerous stalls food and drink. The Esplanade, which is also a roadway and seawall, extends for 8 kilometers along the northern side of the Central Havana neighborhood. The carnival will go on from this weekend until the next. It will culminate with the Children Carnival on October 28. “We hope this year’s carnival is better serviced because of better supplies. We’re (already) looking forward to next year, which is Havana’s 500th anniversary,” said Eugenio Blanch. Apart from the floats and carnival krewes, the Malecon will also play host to favorite local music dance groups such as Las Anacaonas, Los Van Van, Elito Reve and Aplanadora, and Charanga Latina. David Blanco and his group, the Duo Buena Fe, Karamba and Interactivo, Yoruba Andabo, Rumbavila, and Rumbatá will also perform during this year’s carnival. 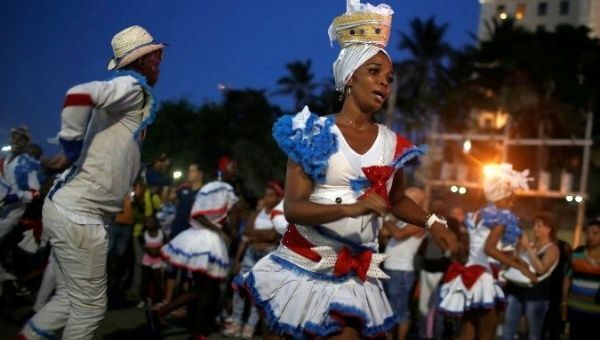 Cuban historians argue that carnival emerged from African cultures and drum traditions that, on the Caribbean island, dating back to the 16th century.